I personally feel that the OTD is a bit of a ‘liberty’ I’ve seen a lot of the memories hit my timeline and am a little peeved about all the memories that what you don’t want to see come flooding in. I think it’s a great feature, my daughter loves it. However not one that I feel comfortable with when I have no control over who’s seeing my history. 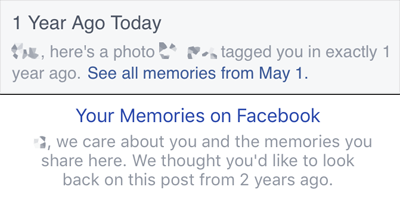 I do admire FB for pushing ever forward, just wished their ‘think group’ were a little more considerate. I love that there is a wider pool of expression emojis to choose from. It’s hard enough trying to express emotion on a computer via typing, especially when we are already missing personal interaction from face to face meetings when interacting on Facebook. It’s so easy to be misinterpreted on Facebook.